Optical density: 5.0 Aperture of the telescope. CAUTION: Never look at the Sun, either directly or through a telescope, without a professionally made protective solar filter installed that completely covers the front of the instrument, or permanent eye damage could result. Note: For other telescopes not listed, please measure the outer diameter of the dew tube and make sure it is approximately (3.58″)91mm. 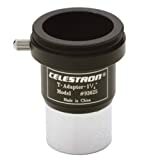 The 60mm Solar Filter is for 60mm aperture telescopes such as Celestron / Orion Tasco / Bushnell D=60mm telescope. 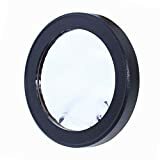 A must-have, white light filter for safely observing the sun and sunspots without damaging your eyes. With Solar Filter you can safely observe the Sun and you don’t have to worry about your eyes. This filter will protect them from harmful solar radiation. The German-made Baader Planetarium AstroSolar Visual film has a uniform structure and provides high-quality images with no distortion. It allows you to see a lot of details on the solar surface such as granulation, solar flares and the structure of the spots. All this you will be able to see with your own eyes. With this filter the Sun will be of a neutral, eye-pleasing white color. Optical density: 5.0 Aperture of the telescope. Never look at the Sun, either directly or through a telescope, without a professionally made protective solar filter installed that completely covers the front of the instrument, or permanent eye damage could result. in a hurry if necessary.